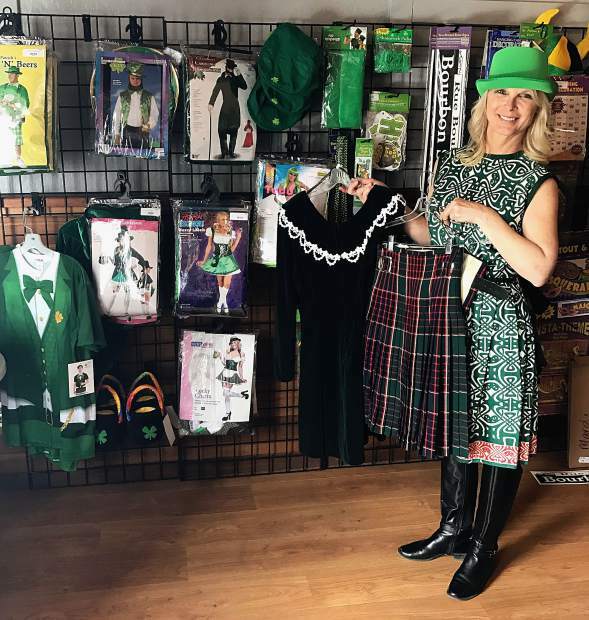 Annette Summers displays St. Patrick's Day costumes including kilts, dresses, wigs and more. 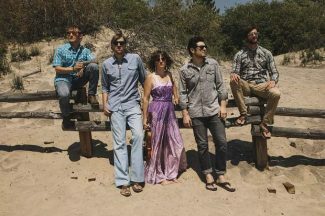 Visit www.dresstheparty.com to learn more about Dress the Party, located at 10052 Donner Pass Road in downtown Truckee. St. Patrick’s Day is this Friday, and we all know what that means — put together your best green look to avoid paying the price of being pinched. 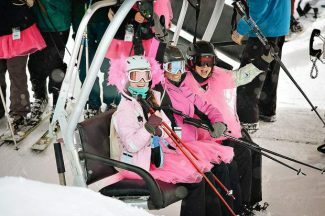 Whether you’ve got a party to attend, kids to entertain or are simply festive at heart, you’re in luck; the Sierra Sun this week caught up with a party expert who’s got your costume needs covered. Annette Summers owns Dress the Party, a vintage and costume boutique located in Historic Downtown Truckee. 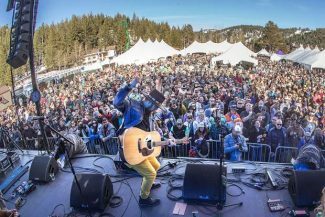 She says any day is a great day to celebrate, and she keeps up with the event scene in Truckee by offering costumes and fun accessories for any occasion, including one-of-a-kind vintage pieces for sale or rent. Dress the Party came to be after Summers decided her background in the biomedical field and careers as an executive weren’t as fulfilling anymore. Her ultimate sign to move to the Tahoe region and run this shop — which was formerly known as “Dress the Part(y)” and located for years in Incline Village — came to Summers after she stumbled across an illustration she had drawn in high school. Now, decades later, she was staring at a picture previously crammed in a folder of old artwork that showed a store layout that is identical to the building she now owns. “I’m reliving my childhood in a way, only better. Now I get to buy all of this fun stuff,” she said. With the store relocated in 2016 to Truckee, Summers keeps a wide array of styles readily available and carries just about any costume you could think of, as well as vintage furs and intricate dresses. The decade section spans clothing and accessories from medieval times through the ‘80s, including go-go boots in a range of colors. There’s a section of beautiful men’s printed shirts from the ‘70s that are uniquely fitted and less baggy than current styles. There is even a contemporary section with everyday items that are sure to catch your eye. The front corner of the store is dedicated to local designers, including pieces from Fresh Air and Salaam (of which local ski racing athlete Lila Lapanja’s mother is a sales rep — Fun Fact: Summers supports this brand in particular as the proceeds contribute to sending Lila, an Incline Village native, around the world to train and compete). Summers and her team are available to help customers make costumes, put together evening looks, and even find vintage pieces that can be worn as a costume but are understated and elegant, making them perfect to re-purpose for a nice night out. Thankfully, Dress the Party is stocked with all kinds of fun accessories to be sure you’re properly decked out this St. Patrick’s Day. 1. You have to have something on your head. A hat is a must when celebrating St. Patrick’s Day, and Dress the Party has several options from headbands to wigs to leprechaun-style top hats at various prices. 2. It’s always a good idea do have something around your neck. Summers showed me how easy it was to create a costume piece out of a pretty vintage earring — she strung it on a piece of ribbon and boom, you’ve got a necklace. Also available are bibs that look like leprechaun vests, green party beads, sashes and scarves with clovers printed on them, and of course plenty of green party beads. 3. Enhance your beauty, in green. Dress the Party really has thought of everything. For those of you looking to enhance your natural beauty, why not opt for some (temporary) green enhancements? You can stock up on green false eyelashes, false fingernails, makeup, hair dye — even a green mustache. 4. When in doubt, accessorize. An easy option for anyone to play along with the festive spirit, the shop offers St. Patrick’s Day T-shirts, tutus and tights to take the guesswork out of putting a costume together. 5. Go big with apparel. Summers stocks gorgeous vintage pieces in the shop that are timeless in their design, making them perfect for a themed party or a classy event. Some of the pieces are available for purchase and others Summers will rent out so you’ve got the perfect ensemble for an event.